In general, I don’t think cars should be made into convertibles unless they were engineered that way from day one. Typically, chopping the roof off of a production vehicle causes all sorts of stability and body roll issues, regardless of how much you want the wind blowing through your hair. But where there’s a will, there’s a way, and some people just have to have a convertible even if the manufacturer doesn’t offer one. 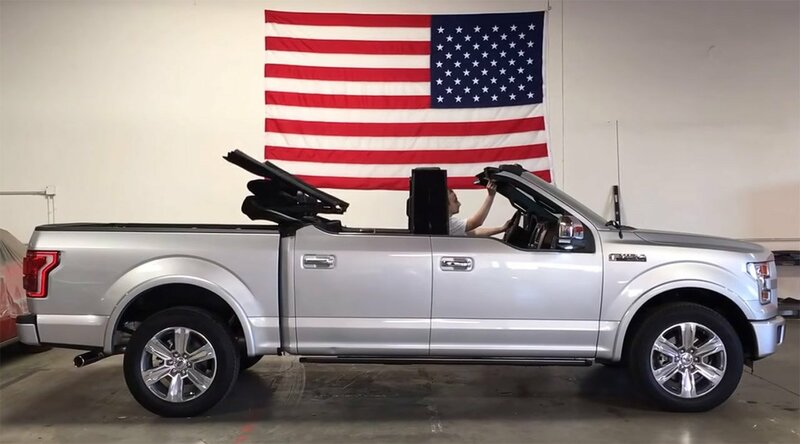 Take, for example, this insane Ford F-150 Platinum build by Newport Convertible Engineering – the same guys behind the Tesla Model S convertible. Yup, that’s a Ford pickup truck with a convertible roof that you just watched. Believe me, I love convertibles – my daily driver is one – but I’d never do this to a pickup truck. It just seems wrong in so many ways. I always think of pickup trucks as rugged and utilitarian, and I can’t wrap my head around this concept. Also, their American flag is hanging backwards. Donald Trump will surely have something to say about that. What do you think of the idea of a convertible pickup truck?